Jemu In French Quarter with her painting. NEW ORLEANS– In a city full of art and culture, inspiration is everywhere we look. We have all wondered about the historic, fun, true, quirky, unusual, weird and strange underworld of New Orleans, right? Well with so many mysteries surrounding the Crescent City, I took my questions to the people who know the city well. Some of the most creative people are scattered throughout New Orleans. It’s part of what makes our city unique. I felt compelled to hit the streets and find out what inspires many of the artists, so naturally I went straight to the nerve center, Jackson Square. This is where I focused in on Jemu Herrington, a portrait artist. 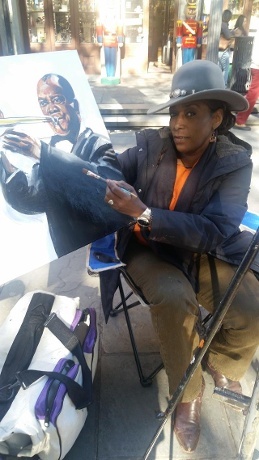 I approached her as she was working on a beautiful portrait of Louis Armstrong. She invited me to sit smack-dab in the middle of her artistic area. Herrington told me she has been interested in art since she was two years old. Over the years she would sit down and draw on her sister’s notebooks while her mother, who was a stylist, did her clients’ hair. During that time, she would draw people, and she’s not talking stick figures. “I would draw the head, the neck, the shoulders, everything,” she said. Herrington said she didn’t realize what she was doing then, but as an adult looking back on those portraits, her eyes glistened with delight. She explained that most kids would have just drawn a stick figure. It wasn’t until she was 16 that her mother noticed her talent. Since then, Herrington said art has been her whole life. Herrington talks about art with a spark in her eye, a fire in her humble belly. She didn’t start out in the Crescent City. Herrington is from Chicago and made her way to The Big Easy in 1989. Something told her to stay and give it the old college try. I asked her how she gets satisfaction. “If you know in your heart that you’ve done a good job, sometimes that is enough,” Herrington said. When it comes down to it, prices will be dropped just to make a sale. Herrington has also expanded the range of what she sells. Portraits are her first love, but she also produces paintings of jazz musicians, abstracts, still lifes and even animals. There are also things that she really enjoys as an artist working in the French Quarter. When there is a convention in town, she enjoys meeting new people and seeing artists succeed. “It’s a good feeling to know everybody is doing good,” Herrington said. Outside of art, she used to write poetry and had an interest in doing children’s book illustrations. “There are a lot of things I’ve put on the back burner,” Herrington said. She said that once she has the opportunity, she will explore her other interests, travel more and do some things that she hasn’t done in life. Like most people, Herrington is on a journey. You may think she has made it, but she is only just beginning. After Hurricane Katrina, she ended up in Santa Fe. She said going back there is a possibility one day. She also wants to work on getting off the streets and selling her art online. She’s working on a website now. Recently she had an offer from someone she met to help her get her website started. As I left my conversation, Herrington continued her portrait of Louis Armstrong, which is for a couple from Australia. They bought a piece from her last year and couldn’t help but come back for another. After all, an artist must make art and stay true to the passion that burns from within.